To help you optimize your magnetic particle inspections, these magnetic particle applicators provide a convenient method for applying an even, adjustable flow of magnetic particles across large test parts or in situations where only spot particle application is required. The coverage speed and consistency provided by these applicators can dramatically improve application uniformity and part processing time. 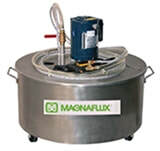 30 gal / 114 L portable Magnetic Particle Spray System with 15 ft / 4.6 m recirculation hose and fan pattern spray gun for inspecting large parts during wet method magnetic particle inspection.